Our powerful truck mounts offer a complete system, so versatile, you can use it for every job with simplicity. Click here to view our all-in-one truck mount manual. Steamvac can solve your Problems! Need a machine that isnt quite in our range or on the market? Do you have an odd job or application that you cant tackle? Steamvac International can help. We can create a custom setup to suit your needs and requirements, wheather it be a Truck Mount, trailer mount or static setup. Head over to our enquiries page and let us know what you are after through an email or give us a call! Don't be fooled by our competitors; this is an affordable truck mount that still offers the quality components and engineering of a more expensive unit. With the objective of a smaller footprint in mind, the SteamVac Boss 590 EFI Truckmount will out perform its rivals above and beyond your expectations. With the re-engineered Hot Vapour Heat Exchanger and the power of a Kohler 25 HP EFI V-Twin engine, you will get more for your dollar. Full 5 year warranty on Heat Exchanger. 25 HP EFI V-Twin Air Cooled Kohler motor. Powder coated Hammer tone finish steel frame. Low oil and water shut off. Can be plumbed to vehicles fuel supply. National dealer network for servicing. FEWER PARTS THAN ANY COMPARABLE UNIT. 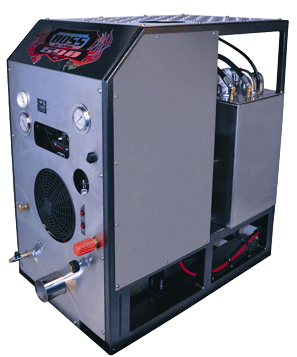 Running a 4000psi seamless stainless steel heat exchange coil with a 4-1 burst rate meaning unlike any imported brand, the Boss 590 EFI does not bypass high pressure away from the heat exchanger meaning you can clean on high pressure and maintain a high level of heat. Another major advantage in the engineering of the BOSS 590 EFI is the fact that it does not dump a single drop of water back to the waste tank which means you are using much less water to do the same job therefore being better for the environment and your pocket. With less moving parts, no need for exhaust diverters or solenoids. The Boss 590 EFI is belt driven for reliability and ease of maintenance. Steamvac Truck Mounts will save you money with our innovative design we believe that you will save up to 60% on your maintenance costs compared to imported brands. Locally sourced parts and a full back up and support network means you will be working not sitting in a repair centre waiting room or waiting for parts to be freighted out from overseas. On all testing procedures the Boss 590 EFI has out performed, even holding 80 -90 Degrees C on the floor at pressures required for tile and hard floor cleaning. Do yourself a favour before you buy anything else make sure you see what the BOSS 590 EFI can do for you! Australian designed and built, this Truckmount is simple yet effective. Yes the yanks make a good machine but their machines are designed for their climate! We are in a tropical climate and don’t need to generate the heat the way they do! 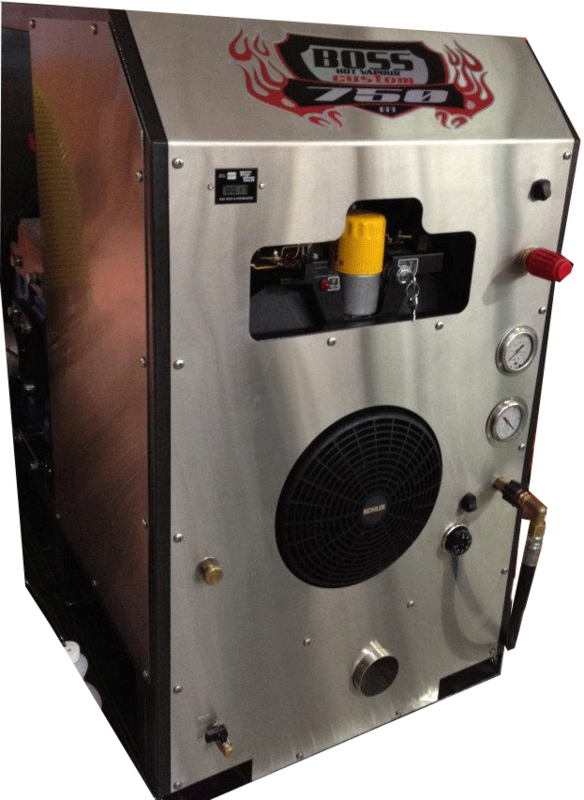 The Hot Vapour Heat Exchanger system will give you 100 c in ten mins or under! The Hot Vapour Heat Exchanger is seamless stainless meaning we don’t run TWIN circuits, so we don’t have to bypass pressure from our heat exchange once over 1000 PSI meaning hotter cleaning temps on HP as well as the fact that we are not loading the motor and blower to generate heat. Half the moving parts than imported brands, which means your working not sitting in a workshop waiting room! And bottom line, nearly half the price of a comparable unit! Seriously you need to check it out! The Space Saver Hose Reel has been developed to maximise the available space in your van. Using the wasted space above the wheel arch, the Space Saver conveniently stores your solution hose and garden hose giving you easy access to your untangled hoses. Made from 100% Stainless steel, the Space Saver requires no maintenance or greasing. The marine grade stainless steel Waste Tank finishes the Boss650 EFI package. With it’s in-built filtration system, and massive 200LTR capacity, the SteamVac Waste Tank makes it simpler than ever to work for longer without the need to empty your waste tank with the auto pump out waste management system. 0 – 100°C in less than ten minutes. Full 5 year warranty on heat exchanger. 2 year warranty on Kohler Engine. Hot Vapour Heat Exchange System giving you 100°C in under 10 minutes. The most versatile piece of equipment ever created and totally Australian designed and built! WHY KNOCK JOBS BACK WHEN YOU CAN HOT VAPOUR THEM ALL! 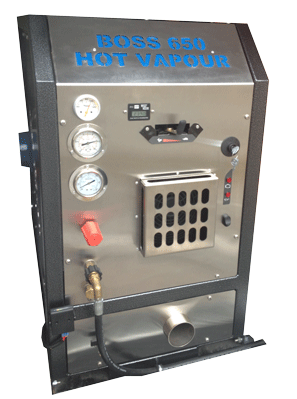 Hot Vapour heat exchange system Truck Mount heat from your portable 100 Degrees C in under ten minutes. 12 KVA generator with key start-work anywhere, anytime! 4 safety switch power outlets. Low oil warning and water shut off. Portable can be easily removed from. Van/trailer for the hard to access jobs. The Hybrid EFI System is renowned as the Most Universal Portable Truck mount available on today’s market. It creates all the power to run your portable and accessories as well as the supply of hot water and full truck mount suction performance. The portable, gulpa, etc. are powered by the generator, thus eliminating separate power leads throughout customers houses and no more blowing of fuses and circuits. HEAT EXCHANGE SYSTEM: Award winning HOT VAPOUR heat exchange system. Gives you hotter temperatures than other systems ensuring drying times are reduced. No moving parts along with any difficult heating controls ensuring less downtime compared to other systems. Proven reliability and performance with reduced maintenance. Maximum and consistent heat during working times over long lengths of hoses. Five-year warranty on Heat Exchanger. Cold water travels through the pump of the portable. This ensures longer pump life, as the seals aren’t placed under heat. Any external garden tap can provide an immediate water source. The vacuum is created from the Roots Blower for as long as you are using it as a Truck Mount, if you are using the portable as a stand alone you simply use the vacuum motors built into the portable. True truck mount features with the portability of using your portable to access multi level buildings. Why not make life easy for yourself or your mechanic and save your hard earned cash by installing the SteamVac EasySlider with your next fit out? Constructed with 6mm angle framework and a heavy duty bearing roller system, the SteamVac EasySlider can be customised to suit most brands and makes of truckmount. Set up your next install with the SteamVac EasySlider for ease of access to carry out maintenance, repairs and servicing. Once the unit is installed to the van, trailer or truck it means that you can safely and securely slide your Truckmount out clear of the vehicle in order to carry out repairs or servicing. The SteamVac EasySlider is the only system of its kind on the market today. Click Here to view our combined manual for all our carpet cleaning machines and/or equipment. To download this manual, open the link above and click save.